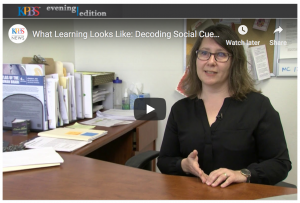 A recent study by Dr. Inna Fishman and colleagues is receiving coverage through the KPBS series, What Learning Looks Like, by Megan Burks. The study, published in the Journal of the American Academy of Child & Adolescent Psychiatry, reveals unique patterns of brain connections involving the amygdala, the region of the brain responsible for the processing of social information, in children and teens on the spectrum. Namely, the study found that children with autism had weaker connections between the amygdala and part of the occipital cortex, a region in the back of the brain, involved in encoding facial expressions, gaze, and other facial cues, which could contribute to the social communication difficulties experienced by those with autism. The SDSU NewsCenter reports on the Center’s mission to provide needed clinical services to low income families, conduct community-centric research, train the next generation of autism scientists and practitioners, to improve lives of people with autism spectrum disorders and their loved ones. Feifei Gao, doctoral student in the Brain Development Imaging Labs, spoke with Spectrum News reporter, Rachel Zamzow, about her latest research on language in the brain. Dr. Inna Fishman’s research on amygdala brain connectivity in children and adolescents with autism spectrum disorders, published in the Journal of the American Academy of Child & Adolescent Psychiatry, is covered by the Autism Science Foundation (ASF) Weekly Science podcast. The podcast provides weekly reviews of the latest autism research news stories by the ASF Chief Science Officer Alycia Halladay. Listen to the podcast here or here. The study and its findings are also covered by the SDSU NewsCenter. A research study published by the scientists affiliated with the Center (doctoral student Jiwan Kohli, Dr. Ruth Carper and colleagues) is featured in the Scientific American. 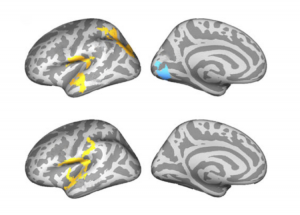 The study found that brains of children with autism have different folding patterns than those of their typically developing peers. Specifically, certain regions of the brain’s outer layer, the cerebral cortex, appear to be more intricately folded in school-age children with autism. Notably, many of the brain areas with exaggerated folding are among the earliest to develop folds during gestation, suggesting that these may be remnants of early developmental disruptions. Dr. Inna Fishman, Director of the Center, and Dr. Mikaela Kinnear, Director of Clinical Services, receive a grant from the UC San Diego Altman Clinical and Translational Research Institute (UCSD ACTRI) aimed at strengthening academic-community partnerships. The award will allow the Center scientists to partner with Unscripted Learning, which – in conjunction with the San Diego National Comedy Theatre – uses improvisational theater and improv comedy to teach creative thinking, listening and social awareness. Drs. Fishman, Kinnear and their team will evaluate whether Connections, a program developed for teens and young adults on the spectrum, leads to improved social and communication skills. Dr. Ruth Carper and Dr. Ralph-Axel Müller’s paper published in the Journal of the American Academy of Child and Adolescent Psychiatry, highlights that children with autism spectrum disorders are lacking a typical asymmetry between the left and right hemispheres of the brain, in comparison to their typically developing peers. In typically developing children, asymmetry between the brain hemispheres reflects different types of processing styles (the left is involved in analyzing specific details, and the right is involved in integrating the information to form a complete picture). This specialization allows the brain to process information more efficiently. In children with autism, however, the “division of labor” between the two halves of the brain is diminished, especially in the right hemisphere, which makes it more difficult to put information together into an integrated picture. See here for news coverage.